Los Angeles is about as diverse a city as you’ll find anywhere on earth. Within its borders you’ll encounter people of every ethnic background and every income level, all living together under the California sun. 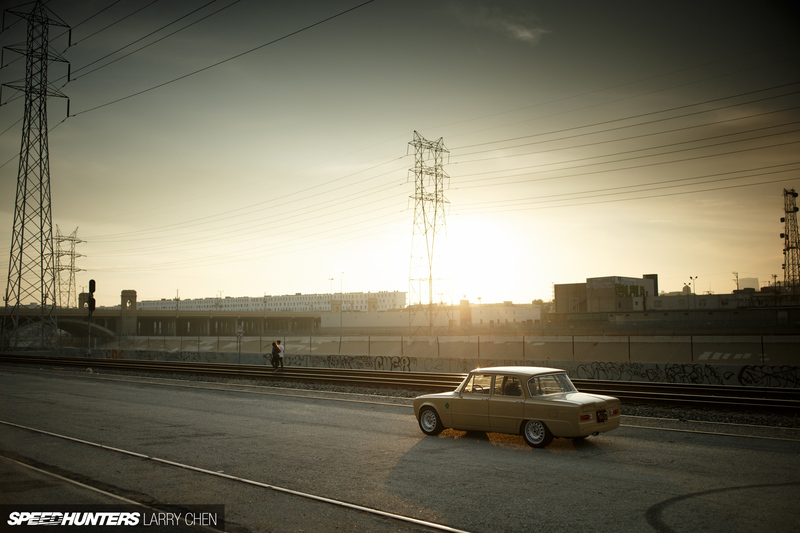 And the same can be said about LA’s world famous car culture. It’s not just the amount of automotive activity that makes Los Angeles such a special place, but the sheer variety of its car scene. Spread across the city you’ll find guys building on every sort of automobile platform imaginable, from 1930s hot rods to modern day supercars. 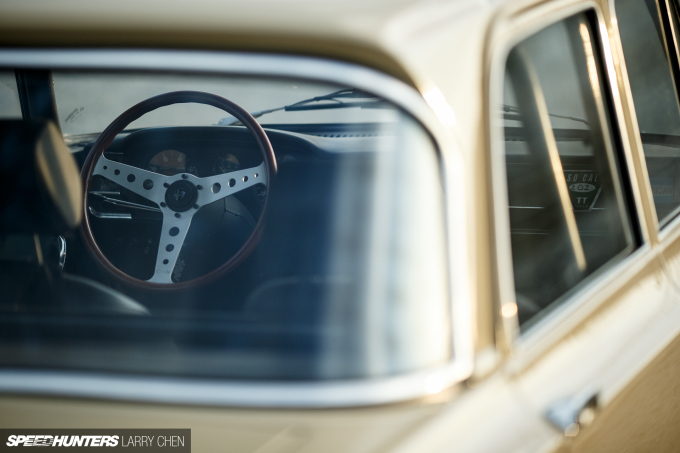 And the work happens in both gleaming showrooms and hidden back-alley garages. 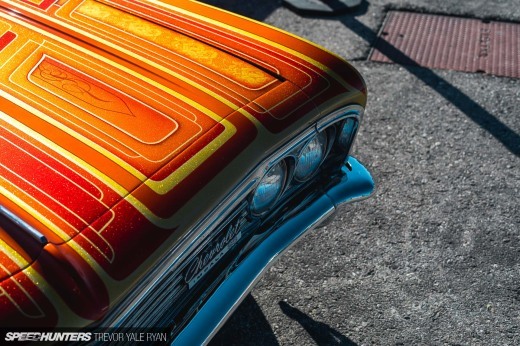 One person who has been adding his own unique flavor to LA’s fusion of car culture is Dorian Valenzuela. He’s someone who can usually be found tinkering on vintage European automobiles at his small workshop called DV Mechanics. Dorian’s passion for engineering and mechanics is very apparent when you look at his extensive and impressive resume. It includes work in the aerospace industry and more recently working with Singer Vehicle Design to help reinvent the air-cooled Porsche 911. 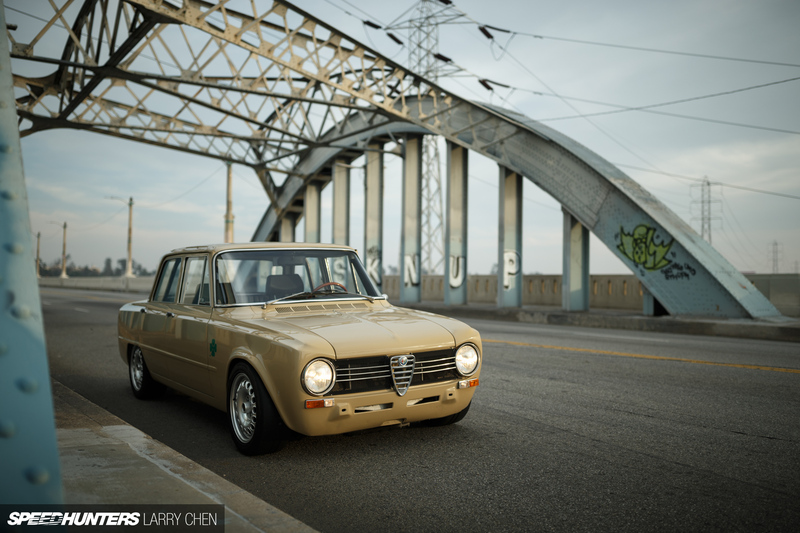 But Dorian might be best known for his love of classic Alfa Romeos, and when he’s not in the garage wrenching, he can often be found driving the LA streets and running the canyons in his 1970 Alfa Romeo Giulia 1300 Ti. 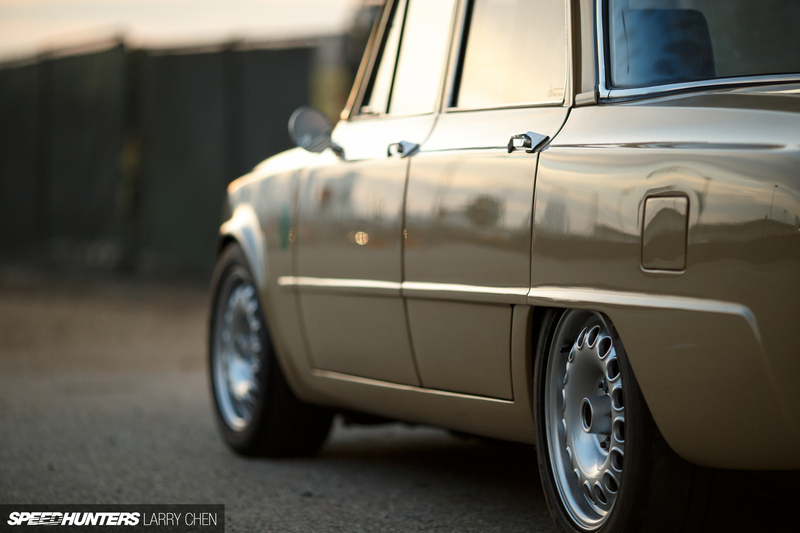 Dorian’s Giulia sedan doesn’t just exude style, it’s a lesson in how to build the perfect, street-going resto-mod. 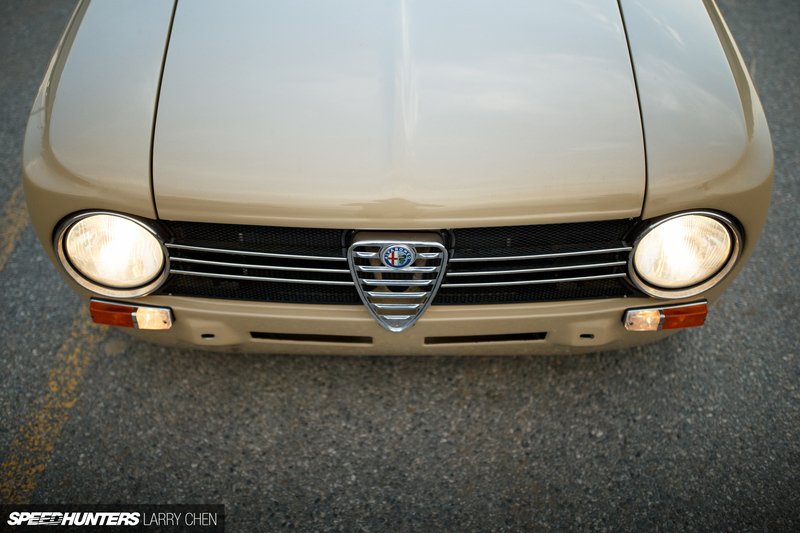 The Alfa retains all of its original character, but with significant improvements both inside and out to make for an even more enjoyable driving experience. 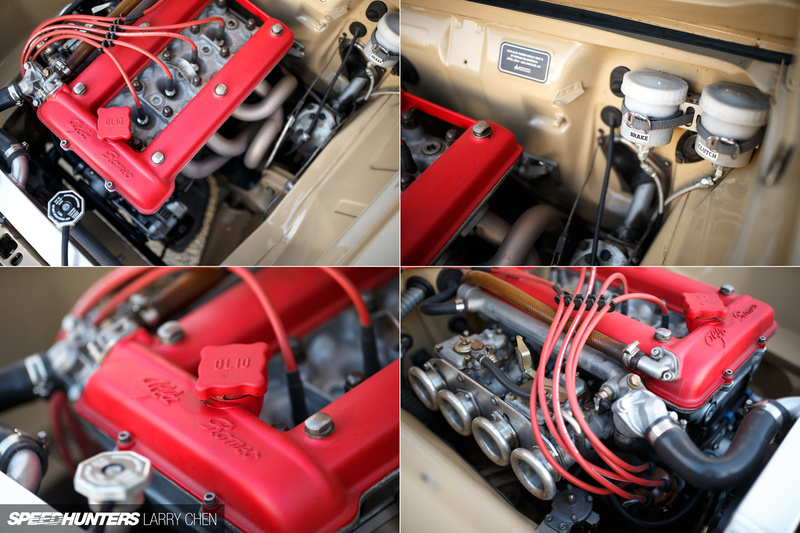 It starts inside the immaculately detailed engine bay where Dorian pulled out the original 1,300cc twin cam Alfa Romeo four-cylinder and replaced it with a fully rebuilt version that now displaces 2,000cc. While the idea was never to build the fastest car around, the engine was built from the ground up for significant improvements both in power and response. Inside the block is a knife-edged crank with heavy-duty Carrillo rods and high compression CP forged pistons. Up top sits a Shankle Stage 5 cylinder head that breathes through a pair of Italian 45DCOE Weber carbs. 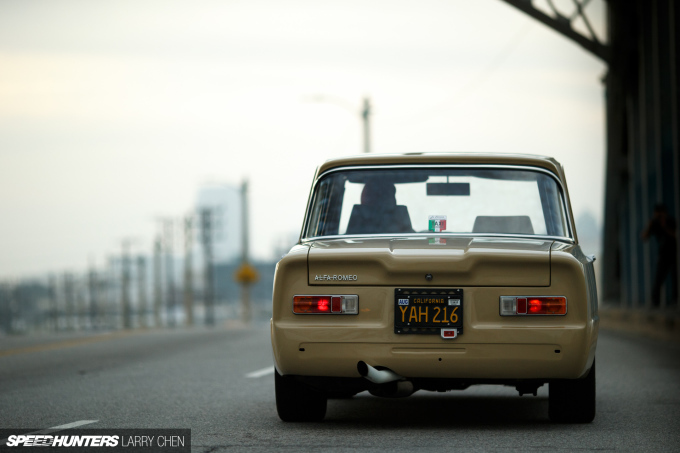 Rounding out the setup is custom-made header feeding a mandrel-bent stainless steel exhaust system that protrudes perfectly from the Giulia’s rear end. When all is said and done, the car makes about twice the power than it did stock, and sounds amazing while doing it. Mission accomplished. Ensuring the output gets to the ground properly is a fully rebuilt gearbox which feeds power through a small-diameter driveshaft to a 4.10 LSD rear differential. 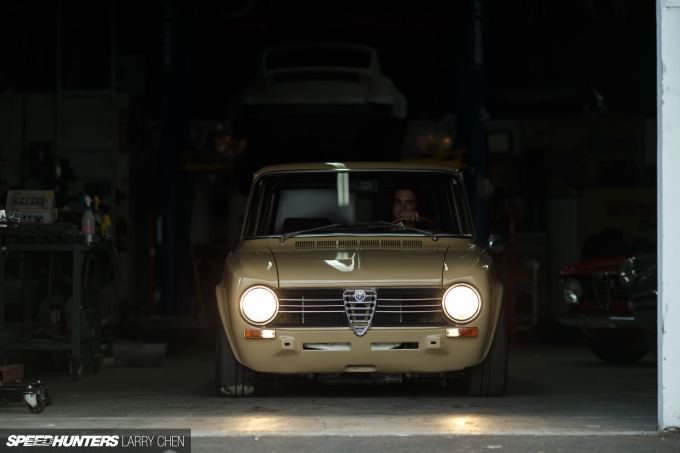 Alfaholics is a UK outfit that knows how to make old Alfa Romeos handle, so when it came time to upgrade the Giulia’s suspension Dorian fitted one of the company’s full race kits. It includes 2.25-inch springs, a 25mm rear sway bar, lightened trailing arms, Koni Race dampers and other improvements to help make the Giulia stick like glue on the twisty mountain roads above Los Angeles. 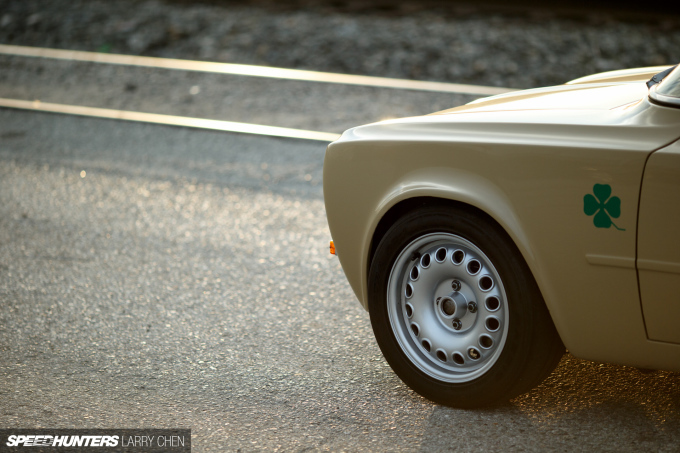 The 15×7-inch GTA Superleggera alloy wheels also come from the Alfaholics catalog and they give the little sedan a look that’s both traditional and aggressive. The tires are sticky Maxxis RC-1s which measure 205/50R15 at each corner. Subtle and tasteful is the name of the game when it comes to the Giulia’s exterior. For the most part the body is original, exceptions being some trim removal and deleted marker lights. Dorian also removed the front and rear bumpers for that classic race car look, and then coated the body in beautiful hue which he calls ‘DV Beige’. 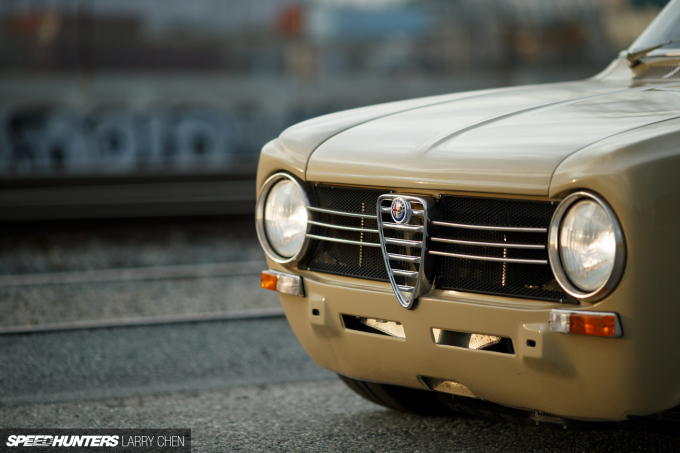 Red is likely the first color that comes to mind when you picture a vintage Alfa Romeo, but this understated tone just works beautifully. 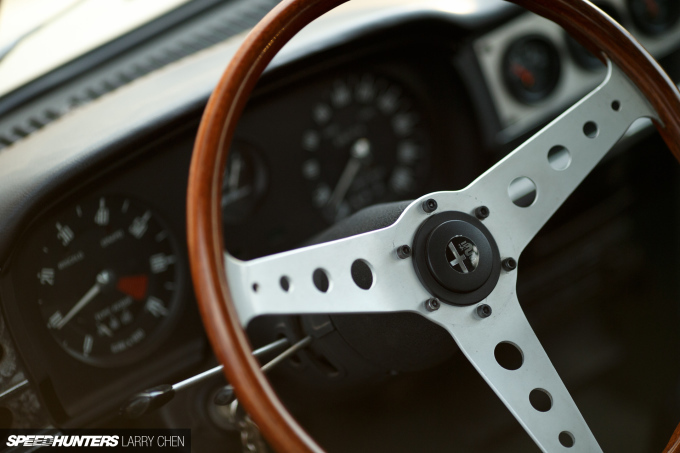 Inside the Giulia’s cabin you’ll find a TJ Russell chrome-moly roll bar setup and a pair of Cobra Classic racing seats mounted on rally-style brackets. A pair of Crow racing harnesses help keep the driver and passenger secure. 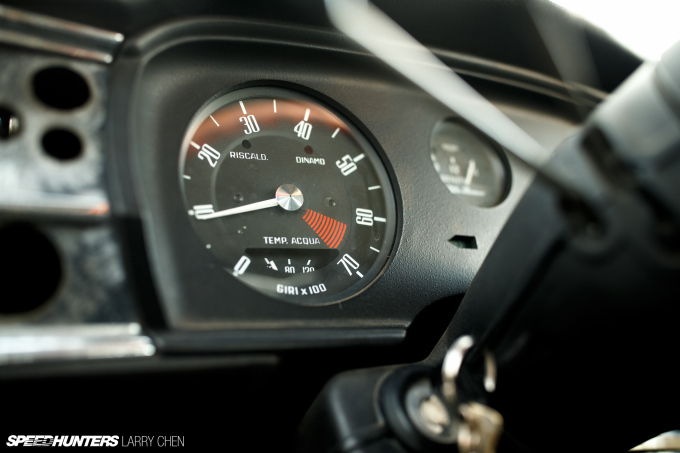 And aside from other little touches, including a cable-to-digital conversion for the instruments, the cockpit is all original. After all, why mess with something that’s so stylish in the first place? 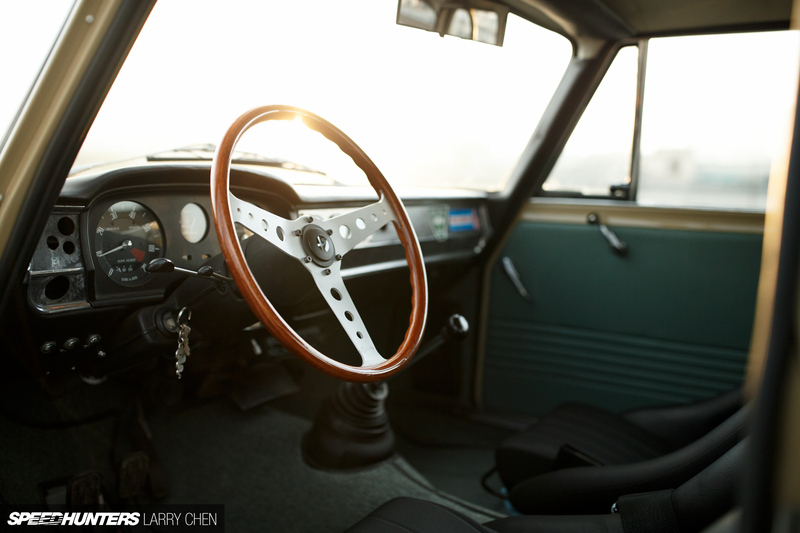 I especially like the contrast between the green upholstery and the beige exterior, and of course the large wood-rimmed steering wheel. 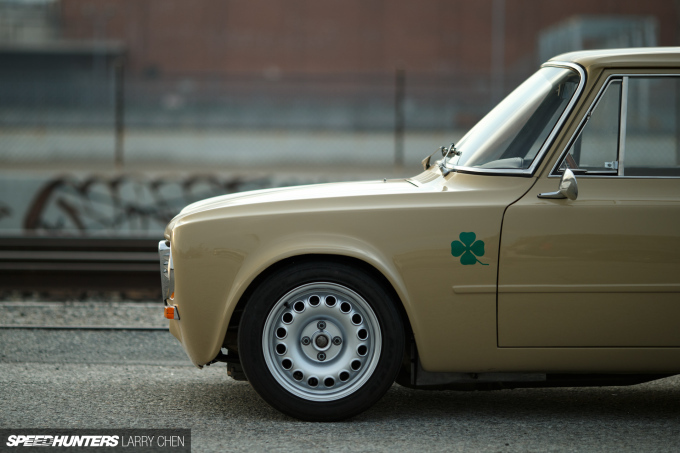 I’ve always felt that a great car is one that inspires you regardless of your brand preference, and I have to think Dorian’s beautiful Giulia is one that makes fans of all who come in contact with it. There’s an honest simplicity to it that anyone should be able to appreciate. 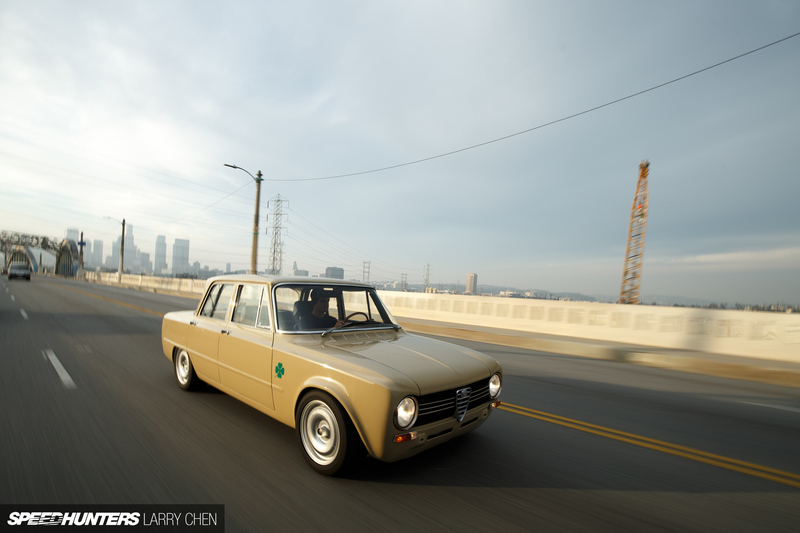 This is a car built for enjoyment above all else, and to us it’s a perfect addition to the sea of interesting vehicles you’ll find on the freeways and backroads of Los Angeles on any given day. 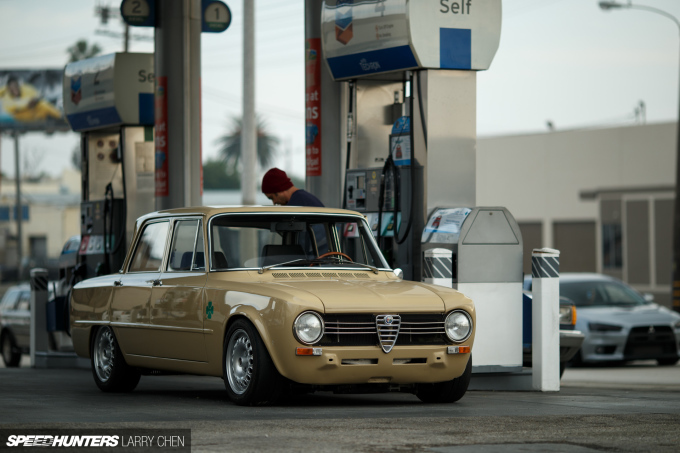 Alfaholics full race suspension, 2.25-inch spring conversion, 25mm sway bar, lightened trailing arms, Koni Race dampers, alloy rear trunnion, rose-jointed steering links, front geometry corrected for roll center & camber. Petrolicious video for those that haven't seen it. 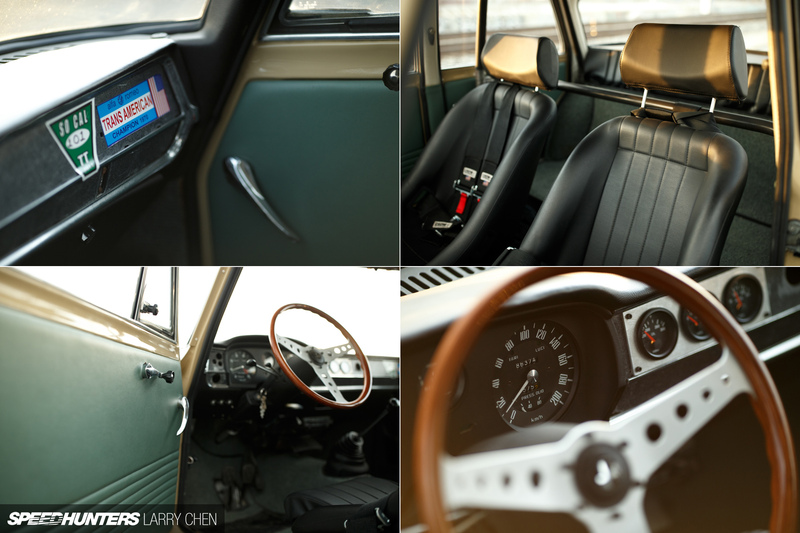 Great car, great article guys; words and photos both really doing justice to this fantastic little car! Yeah nice car,... i got one but it needs to be restored completly. 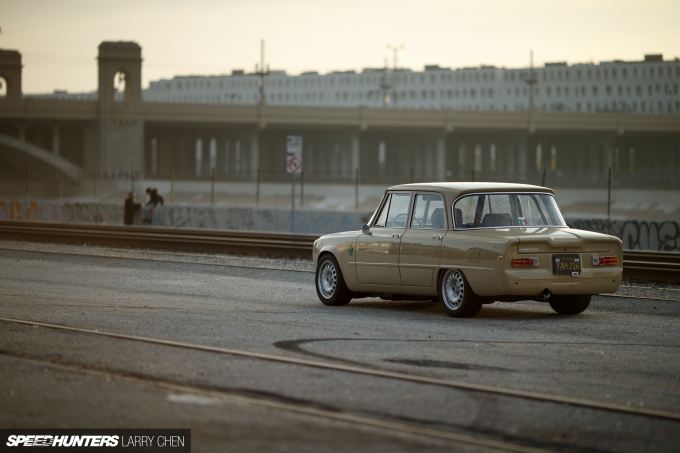 basicly a super nuova but all the special parts of a Berlina 2.0 with a 40% limited slip rear axle, extra doors and parts of a 69 1300 tii and rare crommodora 5 stroke weels. KeyboardWarriorNo1758395 I used to ignore that Petrolicious video for a while as I like the Japanese flavours more, but damn. Sometimes it makes me wonder where did I make the wrong decision and why. Why did I waste so much time? I mean, I'm 26 and I'm still working on a BSc degree. I love cars yet I'm driving in a hand-me-down automatic Accord. Heck, most of the cars I like were produced before I was born back in '89. My friends, even my girlfriend look at me with strange eyes and I just hope. I just hope that one day I will receive the fancy graduation paper from the university I'm attending, start working a normal job (not a minimal wage **** I am doing for over a decade now) and...buy a car. I mean I look at all these success stories and I just think - how? How could they have that and enjoy it so much and yet I am spending my days away trying to understand Turing machines. I want to learn to weld, I want to learn to paint, I want to learn to set up suspension (*cough* Thanks for the theory MotoIQ! *cough*), but I am learning Java instead. Oh well. Time to go back to studying and working towards the day I buy that car I mentioned above. P.S. Kudos for the amazincredible (that is a legitimate English word, yes) build that defined the whole life of the owner! Dimitry Mochkin KeyboardWarriorNo1758395 I'm right there along with you bud, driving my beat up automagic Impreza 2.2l wagon waiting for the day I can buy a Datsun 510 or a Z and work on it for stupid amounts of time and enjoy every second. Just keep your head down, work hard and stop waiting for things to happen - we have to make things happen for ourselves, especially people our age (I'm 26 too.) I'm studying for Cisco certifications so I can quit my current job, save more money, move into a place with a garage and start learning as much as I can about this disease we share. 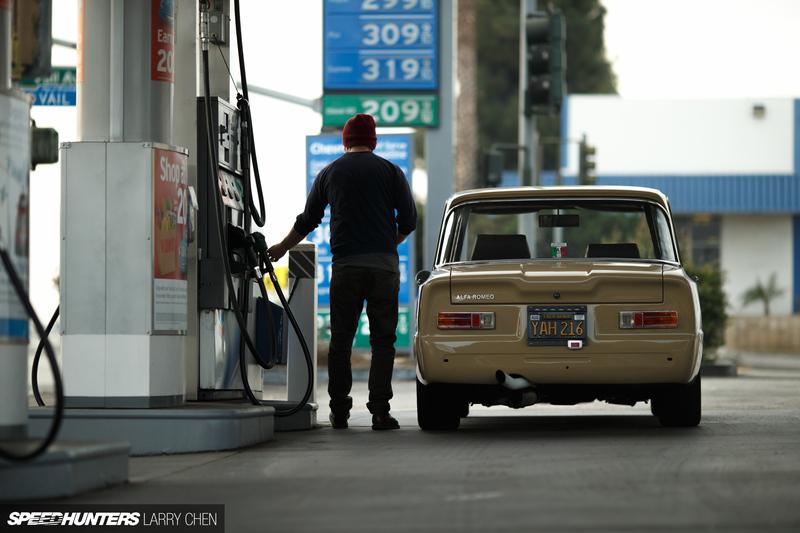 All this recent old metal on these pages, especially all of the Datsun coverage has been killing me. It's not just that I feel like I am missing out but with every nice car featured I can just vibe the value of these cars increasing by the day! oh, you too Jay Leno, you're just as guilty! Dimitry Mochkin KeyboardWarriorNo1758395 Look son, you work hard and your dream will come true one day. I owned a Guilia 1.3 40 years ago with quad headlights and seeing this I want to build one but at over 70, I no longer have the resources to do so. Good luck. 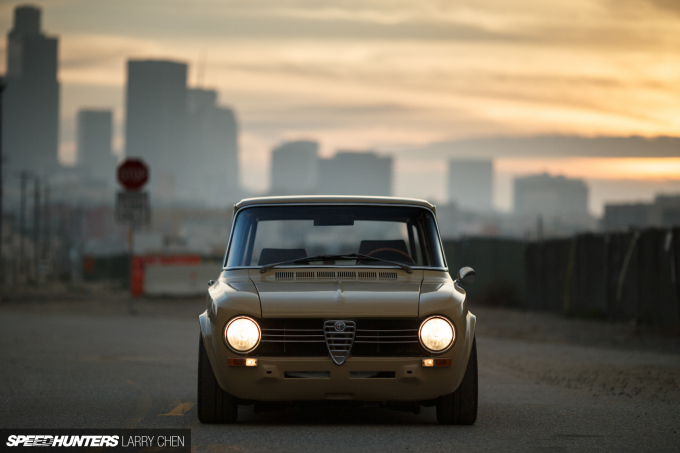 Looks like an Italian Hako sedan. Been a fan of this car since seeing it at CC Irvine. CharlieJoiner Dimitry Mochkin KeyboardWarriorNo1758395 We all have that dream, it all takes time, something I'm learning at the moment. my car has been off the road for 3 months now awaiting me to have a new one made and buy all the supporting bits and bobs, I've been cycling everyday to and from where ever I need to go and it feels like I haven't driven it in forever. When that's done there is still a massive shopping list of parts I want to fit but that won't be for years. I have this picture saved as my desktop at work to help remind me what I'm working for. (Yeah it's a Golf but it's my golf) I'm only 24 and have done so much to it already and like you want to learn fabrication skills so I can do literally everything to it that I want to. Dimitry Mochkin KeyboardWarriorNo1758395 I'm in the same boat man (kinda). I'm 23 and studying a bachelor of engineering with honours in mechanical, however I'm a qualified mechanic (completed before I started my studies) and the smartest thing I ever did was not fork out money for a cool project and put myself in debt during my apprenticeship. I was able to realise working as a mechanic at a dealership wasn't for me and I wanted to continue with my studies and without any financial debt I was able to pack everything up move town and start studying and am now earning half the money I was working full time. Fingers crossed I will have completed my studies by the end of next year and looking for work, to which point a house with a garage and a project car will fall nicely into place! Anyways random rant by someone on the internet, all I can say is enjoy your studies make the most of them! KeyboardWarriorNo1758395 Thanks for the link.....what a beautiful car. I love this. 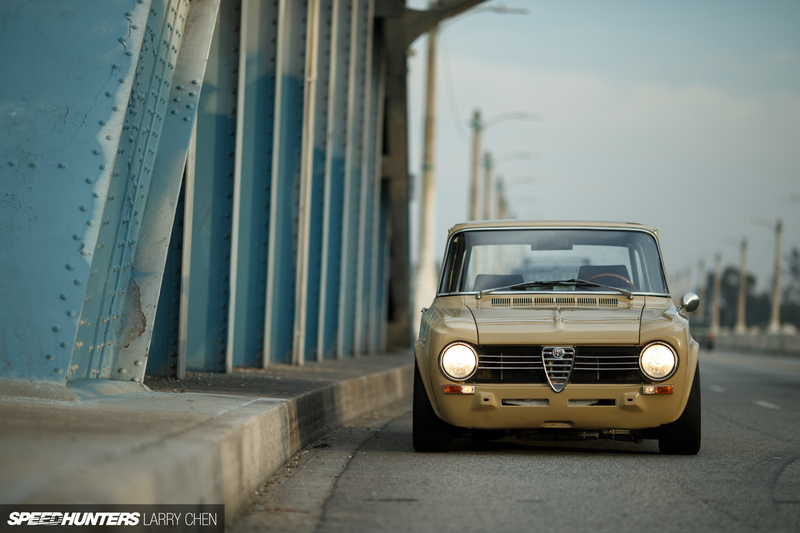 I have a somewhat misguided love for the Giulia, and that colour!!! 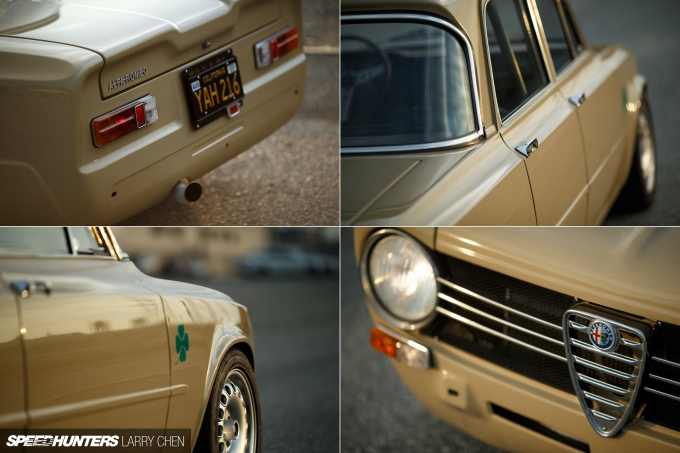 I grew up with an uncle owning a 2000GTV in the same Beige Cava hue. Loved it. I got the same project sitting in the garage. But I have a lot of work to do. Same engine, suspension and wheels but she will be painted in Alfa Rosso! I'm really not into Alfas but wow this thing is perfect. Great job and great car. 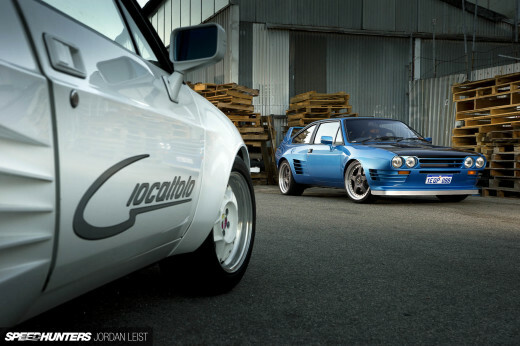 Oh my god that's my favourite thing on Speedhunters ever. I'm an Alfa - Lancia Delta enthusiast in Quebec, Canada. 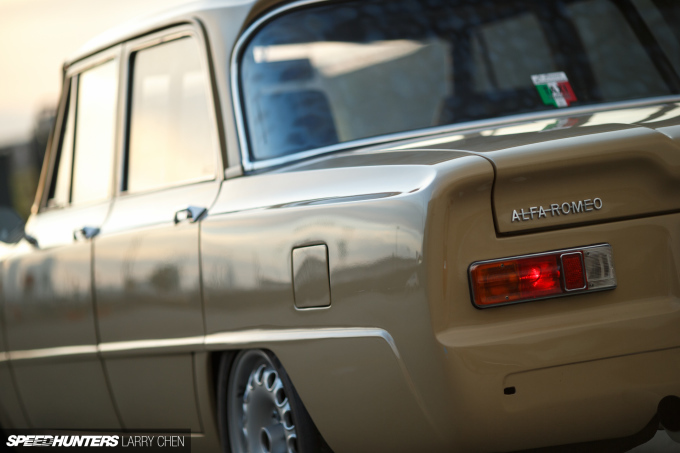 I import them, an founded the Alfa Club in Quebec city. My father at one time in the early to mid 70's own 6 Alfas (Alfetta 1.8, Alfetta 2.0, Alfa GTV 2 lt, Alfa GT Junior 1.3, Alfa Romeo Giulia 1.3, and 1 for spare parts only Alfetta 1.8) and he let me drive The Guilia 1.3 back then. 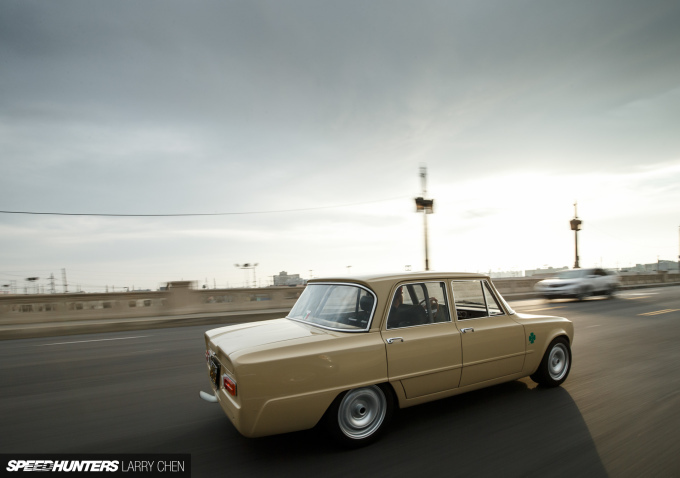 Alfas weren't very reliable especially Alfetta's 2 piece driveshaft, especially if you yank the clutch to get a good acceleration. Fast forward 40 years in my retirement now I want to buyt an Alfetta 1.8 and put an SR20DET engine (Alfa's stock engine - with the exception of the current generation - were all normally aspirated). 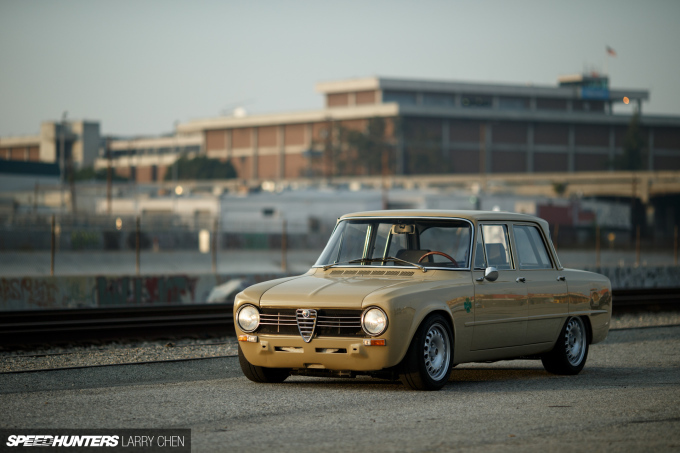 My question is: how difficult a modification to replace the stock Alfa twin cam 1.8 with SR20DET and will the driveline stand the punishment of a more powerful and torquier engine? I appreciate any tips / suggestion / comments. 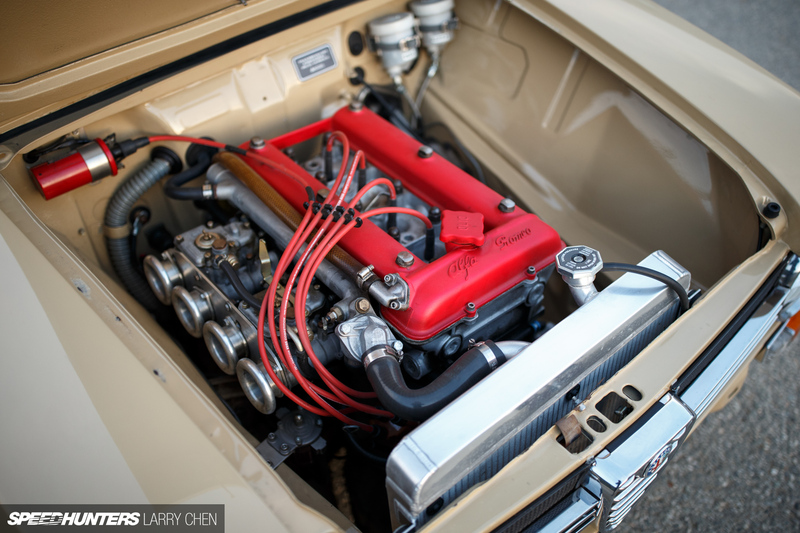 I intend to replace the stock Alfa 1.8 twincam in the Alfetta 1.8 engine bay with SR20DET. How big a modification will this be and has it been done before? Also will the Alfetta drivetrain and transmission be able to withstand the torque and power of the SR20DET? Any suggestion / tip /comment is appreciated. Appriciate the love and care for this classic Alfa. I got one but it needs to be ovehault completly. Its basicly a super nuova but with all the parts of a Berlina 2.0, a limited slip diff of 40 percent, 5 spoke crommodora wheels , special dash extra doors you name it and its there. Could this be something of your interest? I'm to old to get started.